The Pennsylvania Fireman, Lititz, Pa.
Firefighter and Northampton, Pa. resident Deven Knoll provides a firsthand account of the many years he suffered with ankle pain, the effect it had on his life and career, and his experience undergoing a total ankle replacement. Deven’s passion in life was his job as a firefighter, however after nearly 30 years of dealing with increasingly severe ankle pain, it became too difficult to continue and he was almost forced into early retirement. A few months before doing so, Deven met with Dr. Jason Piraino, who was then at Temple University Hospital in Philadelphia and learned that he was an ideal candidate for the INBONE® Total Ankle Replacement. Having the surgery in 2011 not only allowed Deven to live his life pain-free, but also to continue the job he loves. He is currently a Lieutenant in the Bethlehem, Pa. fire department. The opinion of Deven Knoll is his alone and does not necessarily reflect the opinions of Wright Medical. These results are specific to this individual only. Individual results and activity levels after surgery vary and depend on many factors including age, weight and prior activity level. There are risks and recovery times associated with surgery and there are certain individuals who should not undergo surgery. Dr. Gary Schmidt from Schimdt Foot and Ankle was a guest on the A.M. Show to discuss total ankle replacements. He touches on the struggles of first-generation implants and notes the improvement in technology in newer systems. He also provides clarity on expected life expectancy of the implants. Components of the INBONE® Total Ankle Replacement were visible during the interview and Dr. Schmidt described how PROPHECY® Preoperative Navigation Guides have enabled surgeons to create a customized plan based on a patient’s unique anatomy through a CT scan conducted before surgery. The opinions of Dr. Schmidt are his alone and do not necessarily reflect the opinions of Wright Medical. This story on total ankle replacements features local resident Bill Walter, who was moments away from being implanted with the INBONE® Total Ankle Replacement, and his surgeon, Dr. Adam Budny from Blair Orthopedics in Altoona, Pa. Bill is a construction worker and elected to have his ankle replaced rather than fused. Dr. Budny described how the PROPHECY® Preoperative Navigation Guides provide a 3-D picture of what he’ll need to do in the operating room through a CT scan conducted before surgery. The story includes video of the surgery and components of the INBONE® Total Ankle Replacement. The opinions of Bill Walter and Dr. Budny are theirs alone and do not necessarily reflect the opinions of Wright Medical. Mary Blake, a Louisville-area resident, is interviewed for a video feature by the Courier-Journal about her total ankle replacement. Her ankle problems began as a result of a bicycle accident and the resulting damage robbed her of mobility and function in a matter of just a few years. When her orthopedic surgeon gave her three treatment options, two of them – shots to inject fluid into the ankle joint and ankle fusion – were immediately rejected. Mary chose the third option and was implanted with the INBONE® Total Ankle Replacement. Today, Mary lives a normal life without pain or disability. These results are specific to this individual only. Individual results and activity levels after surgery vary and depend on many factors including age, weight, and prior activity level. The opinions of this doctor are his/hers alone and do not necessarily reflect the opinions of Wright Medical. Summary: Editor Dr. Robin Wulffson published a feature on the INBONE® Total Ankle Replacement that includes commentary from Dr. Justin Franson of University Foot & Ankle Institute in Valencia, Calif. Dr. Wulffson touches on the advantages of ankle replacements versus ankle fusion, which limits a patient’s mobility and flexibility. Dr. Franson’s patient Marylynn shared her story of how she endured years of debilitating pain until she could barely walk. In September 2013, Marylynn received her new ankle and today, is enjoying her favorite activities without pain. Dr. Peter Mangone at Blue Ridge Bone & Joint and his patient Tom Hunt are interviewed for a story on the INBONE® Total Ankle Replacement. Dr. Mangone offered insight as to how the INBONE® Total Ankle Replacement functions and the expected recovery time. Tom discussed how his new ankle has afforded him the opportunity to return to work pain-free and resume some of his favorite activities, such as hiking and golf. These results are specific to this individual only. Individual results and activity levels after surgery vary and depend on many factors including age, weight, and prior activity level. The opinions of Dr. Mangone are his alone and do not necessarily reflect the opinions of Wright Medical. he Cleveland Plain Dealer published a comprehensive story on hammertoes, including causes, prevalence and available treatments. Health Editor Ellen Kleinerman focused specifically on how factors such as wearing inappropriate footwear, injury to a toe and joint diseases can cause the painful condition. The article alluded to the inconvenience and discomfort associated with K-Wires and the positive benefits of the MiToe™ Hammertoe Fixation System. Cynthia Pittman-Osula, who underwent six hammertoe corrections with the MiToe™ Implant, noted that before she elected to undergo surgery, she could barely walk. Today, she is walking pain free. Dr. Richard Berkowitz of Complete Foot Care stated that the permanent nature of the MiToe™ Hammertoe Fixation System reduces the chances of hammertoes returning. These results are specific to this individual only. Individual results and activity levels after surgery vary and depend on many factors including age, weight, and prior activity level. The opinions of Dr. Berkowitz are his alone and do not necessarily reflect the opinions of Wright Medical Technology, Inc.
Reporter Pamela McKuen wrote a feature article on advancements in joint replacement surgery, including the proliferation of total ankle replacements. McKuen specifically highlighted the benefits of the INBONE® Total Ankle replacement system including the precision of the INBONE® and its ability to mimic the fluidity of the natural ankle in motion. Dr. Douglas Pacaccio, a podiatrist with Advanced Foot and Ankle Surgeons in Sycamore, Ill., provided additional perspective about the increasing prevalence of total ankle replacements. The opinions of Dr. Pacaccio are his alone and do not necessarily reflect the opinions of Wright Medical Technology, Inc.
Tucson, Arizona resident Michael Hill and orthopedic surgeon Dr. Geoffrey Landis at Tucson Orthopedic Institute were interviewed for an article on the INBONE® Total Ankle replacement that appeared in the Sierra Vista Herald newspaper. In 2009, Hill fell off a six-foot ladder fracturing the lower portion of his right leg; the injury required major surgery. Six months later, Hill began to experience pain in his right ankle, an MRI revealed that the prior injury caused damage to his ankle joint and the cartilage was wearing out. After learning about the benefits of the INBONE® Total Ankle replacement procedure, Hill elected to go back under the knife. Just 4 months after his surgery, Hill regained the mobility in his ankle and was back to work, pain free. The opinions of Dr. Landis are his alone and do not necessarily reflect the opinions of Wright Medical Technology, Inc.
Henderson, Nev. resident Tom Thomason and orthopedic surgeon Dr. Troy Watson at Desert Orthopaedic Clinic were interviewed for an article on total ankle replacements that appeared in The Henderson Press. Tom injured his ankle as a young athlete while serving in the U.S. Army Special Forces and eventually developed severe arthritis. He endured years of constant pain and difficulty walking before he finally consulted his physician. Tom declined an ankle fusion procedure that would have limited his mobility and chose the INBONE® Total Ankle System to replace his right ankle. Today Tom is walking without pain, able to play with his grandchildren and go on walks with his family. 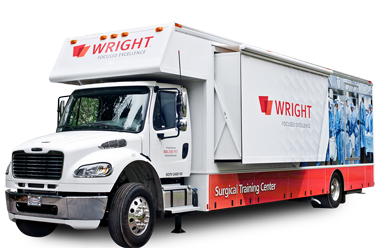 The opinions of Dr. Watson are his alone and do not necessarily reflect the opinions of Wright Medical Technology, Inc. Stiff joints and arthritis are nothing new for medical professionals, but ankle replacement surgery is catching on as a new tool to combat these common conditions. Osakis, Minn. resident Lindsay Niehoff and Dr. Russell Sticha at Heartland Orthopedic Specialists were interviewed for an article on total ankle replacements that appeared in The Osakis Review. Lindsay dealt with ankle pain for five years after she broke and dislocated her left ankle in December 2004. The initial surgery to place pins and a plate in her joint left Lindsay with pain when walking and limited her range of motion. In 2009 Lindsay received the INBONE® Total Ankle System in her left ankle. Today she has regained much of her mobility and is able to enjoy golf without pain. The opinions of Dr. Sticha are his alone and do not necessarily reflect the opinions of Wright Medical Technology, Inc.
Maryville, Tenn. resident Cindy Moore and her orthopaedic surgeon, Dr. Tracy Pesut at Tennessee Orthopaedic Clinic, were interviewed for an article on total ankle replacements that appeared in the Knoxville Journal. Moore previously had an ankle fusion on her right ankle and was not satisfied with the outcome. However, she was pleased with the results of the INBONE® Total Ankle System that Dr. Pesut implanted in her left ankle. For the first time in several years, Cindy is now able to move around without having to rely on a motorized scooter or wheelchair. The opinions of Dr. Pesut are hers alone and do not necessarily reflect the opinions of Wright Medical Technology, Inc.
Orthopaedic surgeon Dr. Tracy Pesut and her patient Cindy are interviewed for a segment on total ankle replacements. Cindy previously had an ankle fusion on her right ankle and preferred the INBONE® Total Ankle System that Dr. Pesut implanted on her left ankle because the INBONE® procedure is performed without fusing the bones or implanting metal screws. Cindy is now able to move around without the help of equipment like a motorized scooter, wheelchair or crutches, which she relied on prior to surgery. The opinions of Dr. Pesut are hers alone and do not necessarily reflect the opinions of Wright Medical Technology, Inc.